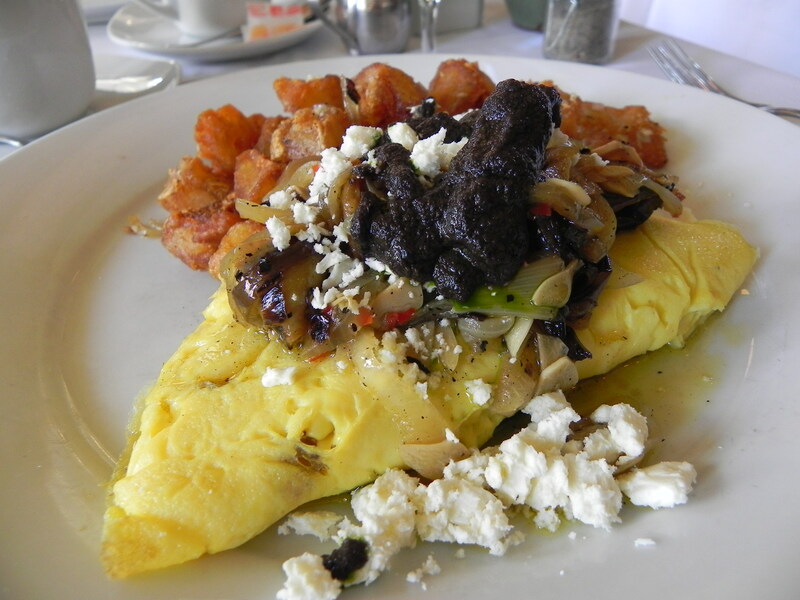 No matter how you spell it, an omelet is indubitably an eggs-cellent creation. In addition to my mom's less-than-beautiful, but always delicious jack cheese and tomato versions, I'll never forget my first restaurant omelet. It was from a hot new breakfast spot in downtown San Mateo that was soon known for its gigantic blueberry pancakes, and admittedly, I would often opt for their special. But one day, I was in the mood for a more savory dish and ordered their “Bacado.” Now, I've seen bacados in other restaurants since, but none were stuffed with the magical combination of bacon, avocado, and cream cheese. It forever rocked my perception of what an omelet could be. Now I seek out the ultimate omelet wherever I go, forever hunting for the next great creation to knock my socks off, like that fabulous Bacado did. As it turns out, I've found several new favorites. Recently opened in the Marigny, inside the rectory of the newly renovated Hotel Peter and Paul, lies The Elysian Bar. This serene, rambling café offers cocktails and hot (or cold) specialty java drinks—brewed from Congregation Coffee beans—and several light dishes created by local chef Alex Harrell. 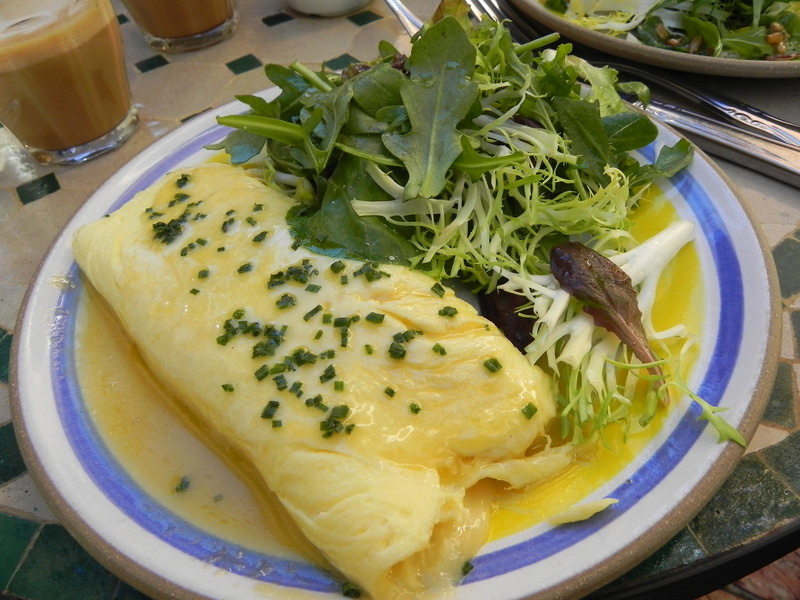 The first time I tried one of his beautiful French-rolled omelets was at his former restaurant Angeline, but this latest incarnation really had me swooning. For only $13, I got a pastel yellow duck-egg “omelette” filled with triple-cream cheese, topped with beurre monte (an emulsified butter sauce) and fresh chives. Served with a lightly dressed mixed greens salad, it couldn't have made for a more perfect breakfast in the courtyard on a sunny Saturday morning. 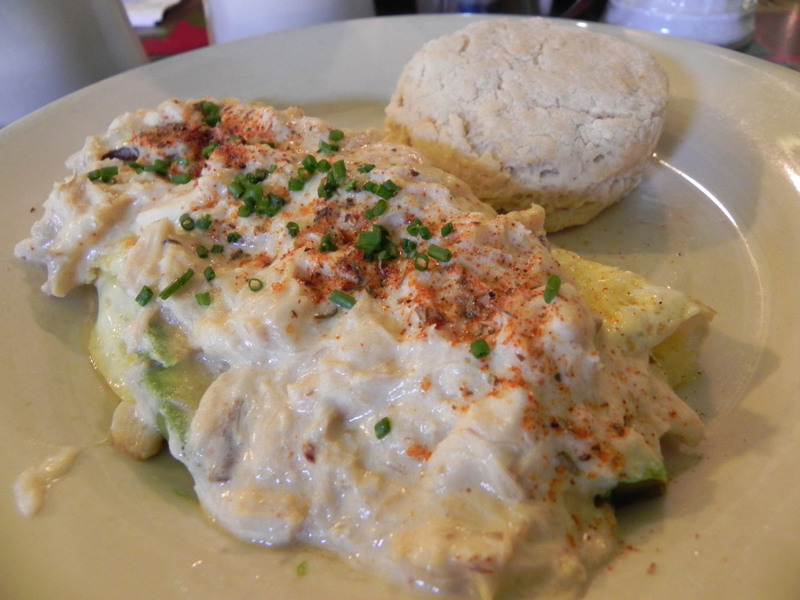 On the corner of Webster and Laurel Streets Uptown, neighborhood restaurant Patois offers an “Omelette du Jour” that changes with the seasons and available local ingredients. On one particular occasion, I inhaled a Mediterranean-style omelet, topped with roasted eggplant, onion, tomatoes, feta cheese, and a tangy tapenade, for $16. This flavor-filled dish was also served with a large pile of their “hash browns,” or fried wedges of golden potatoes that were crispy on the outside and creamy on the inside. One simply can't talk about omelets without talking about Surrey's Cafe and Juice Bar. Long a local (and visitor) favorite for amazing breakfasts, this tiny spot near the corner of Magazine and Terpsichore Streets in the Lower Garden District offers all kinds of terrific dishes, from their Bananas Foster French Toast, stuffed with banana cream cheese, to some seriously fabulous huevos rancheros with corn tortillas and molé sauce. 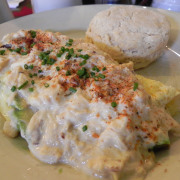 But their crab meat omelette, stuffed with avocado and brie and topped with a jumbo lump crab sauce, is definitely a dish to remember. At only $13.75, this ginormous beauty is served with your choice of toast or one of their homemade biscuits. 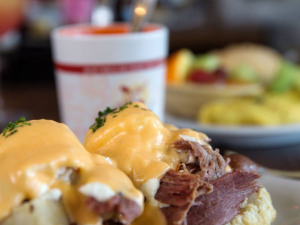 The recently refurbished Pontchartrain Hotel is home to the Silver Whistle Café, a breakfast spot that was once famous for being the place to be for the city's most influential movers and shakers. This quaint café with framed cartoon images on its walls is a great spot for breakfast, featuring a modest menu and java brewed from Revelator Coffee Co. beans. Though it's tempting to order the breakfast po-boy with scrambled eggs and andouille, give their pimento cheese omelet a try. It’s served with crispy hash browns and topped with lemony hollandaise for only $12. Finally, if you know me and have read my columns for the past eight years, you'll know that it's pretty much impossible for me to talk breakfast without recommending Toast. Whether it's the original restaurant on Laurel Street, the Fair Grounds spot on Gentilly Boulevard, or the latest that just opened on Decatur Street in the French Quarter, Toast offers irresistible breakfast options at fantastic prices. Chefs and owners Cara and Evan Benson offer a fantastic menu, with dishes like a hangar steak with tarragon aioli and Lyonnaise potatoes, both sweet and savory crepes, fluffy aebelskivers (puffed pancakes) dusted with powdered sugar, and, of course, toast topped with avocado and eggs or honey, prosciutto, and ricotta. Along with all of these excellent choices, all of the locations also offer a few omelets, my favorite being their veggie version, with house-made ratatouille, sautéed spinach, and chevre, served with fresh fruit or a side salad, for only $9.